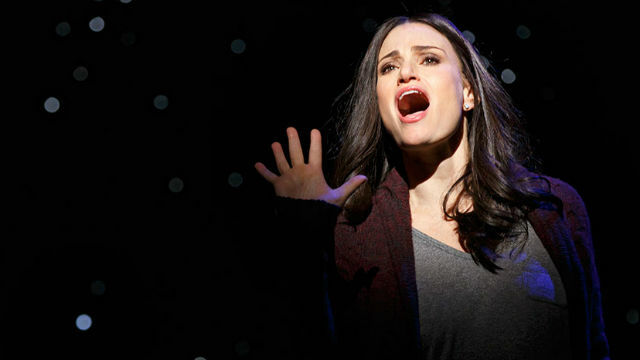 How many power ballads does it take to make an Idina Menzel musical? Judging by the score of the 2014 “If/Then” the number is limitless. There’s even a song called “Here I Go,” which could be substituted with “Let It Go,” Menzel’s knockout number from the animated movie, “Frozen.” But that’s another story. This story, written by the creators of the dark and delectable “Next to Normal” (music by Tom Kitt, book & lyrics by Brian Yorkey), is about chance and choice, and the paths not taken. We meet Elizabeth (Menzel), and follow two tracks her life might have taken: one a single woman with a high-power job; the other, a professor who’s a wife and mother. Those around her, devoted friends gay, straight and undecided (some of whom want to sleep with her) remain the same. It isn’t always easy to keep track. One incarnation of Elizabeth wears glasses and loose clothes; the other ties her hair back and sports crisp business attire. I’m told that another helpful identifying feature is that one is backed by mostly orange lighting and the other primarily blue, but even after knowing that, it wasn’t obvious. Subtlety in the distinctions is one of the weaknesses of the show. Another is the score; most of the songs sound very much the same, though the lyrics are quite clever. When you can hear them. The sound at the Civic Theatre was about the worst I’ve yet experienced. The women (especially Menzel and the powerhouse vocalist La Chanze) sounded exceedingly shrill, and it was virtually impossible to understand anything they sang in their upper ranges. Some of the men (notably Marc Delacruz) could barely be heard at all. Another shortcoming: neither of the alternate lives is all that interesting. Not that much of great significance happens to Liz or Beth. The one who gets married gets a real hunk. Angst ensues (Elizabeth is kinda neurotic). But she’s also smart, sassy and very good at what she does (urban planning). The best thing about this touring production is that San Diego is one of only seven cities on the 10-month tour that benefit from the appearance of four of the original Broadway cast members: Menzel and her long-ago “Rent” co-star Anthony Rapp (playing a similarly politicized, kind of wishy-washy character); La Chanze and the hunky James Snyder. The rest of the 14-member cast is quite talented and malleable (they have to be; each plays about a zillion roles). The direction (by Michael Greif, former artistic director of the La Jolla Playhouse, who also directed “Rent” and “Next to Normal” on Broadway) is sharp and crafty, as is the choreography (Larry Keigwin). The costumes are colorful and variable (though not all are flattering to Ms. Menzel). The set (Mark Wendland) is a cunning suggestion of various New York City locales, backed by terrific projections (Peter Nigrini & Dan Scully) of streets, grids and moving subway scenery. The nimble orchestra includes touring musicians and ten locals. Some audience members seemed confused by the show’s structure. It’s definitely more complex (and longer and more repetitive) than it needs to be. But this cast is divine, and the contemplation of “What If?” (the title of the opening number) is frankly irresistible. Performances are Thursday-Saturday at 7:30 p.m., Saturday at 2 p.m., Sunday at 1 p.m.
Running time: 2 hrs. 40 min.